Photo: Dennis Anderson. Dennis and Nina’s back yard. No, not Whitehorse. Tucson, Arizona. My friends, Dennis Anderson and Nina Lee Colwill, go to Tucson every winter to escape from -42 with-a-windchill Manitoba for a few months. Most of the time the narrative that returns via email is one of blue skies, warm winds, flowers, sunshine. The pictures are delicious. The cacti look good enough to eat. Photo” Dennis Anderson. 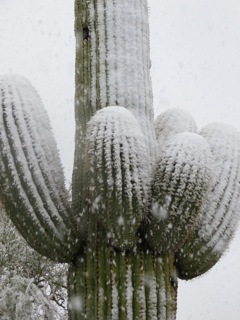 Yup, that’s a cactus with snow falling on it. This year it was different. This is the year that will send orange prices so high that you will hold your children in your arms and say to them, “Once upon a time we bought a dozen and ate them all.” As you look longingly at oranges kept behind barred windows along with diamonds and gold. Photo: Dennis Anderson. This is a golf tournament. Dennis gave up his $42.00 ticket and watched it on TV. 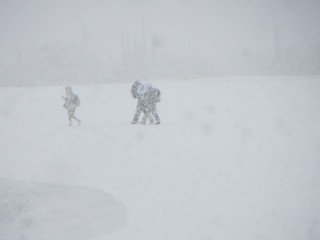 No, this is not golfing in Churchill, Manitoba. Photo: Dennis Anderson. These are golf spectators. According to Nina, when they arrived, the rhodos were in bloom. All was right with the world. Golfing was underway. Photo: Dennis Anderson. 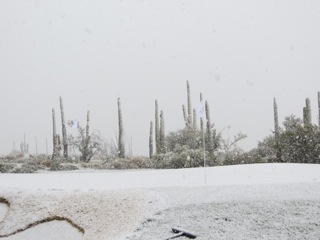 And just in case you missed it, those are cacti standing tall in the blizzard. Have you seen the pictures on TV about the fierce blizzards on the Great Plains all the way down into southern Texas. This is where I used to go for holidays. Fabulous country. Palm trees. Rice fields. Real cowboys herding along the little dogies. Orange groves. Grapefruit trees. Papya trees. Recent pictures of Texas looked like northern Saskatchewan on a bad day. This blustery weather didn’t stop at the Texas border. It kept right on going. I saw these pictures and went out and bought myself some grapefruit and ate them. Shortly, I may not be able to afford them. Nina tells me that after the first hard frost all those beautiful flowers were dead and the gardeners started pruning the branches. Think what weather like this will do to fruit orchards. In Manitoba or Saskatchewan or North Dakota, we’d say, that’s what it looks like every winter. Except, of course, for the cacti. But Tucson? Maybe there’s climate change. Maybe there isn’t. I’m not scientist. 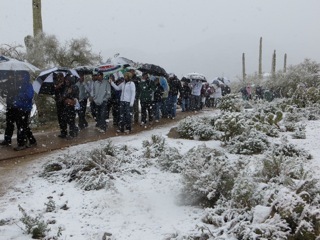 But having to take your parka and mukluks on a holiday to Tucson? 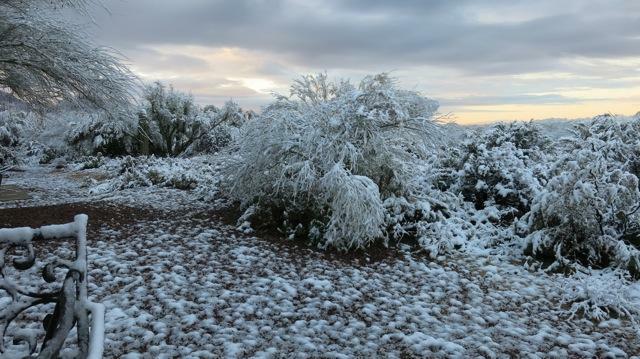 This entry was posted in Uncategorized and tagged Arizona, climate change, golf, holiday, tourists, Tucson, weather by william. Bookmark the permalink.